Continue reading McKinsey PEI – Any difference between conflict and disagreement? 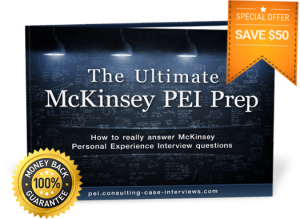 Continue reading Not yet prepared for my McKinsey PEI – can I postpone my interviews? Continue reading Is it OK to re-position your McKinsey PEI stories, or better have new ones? But why not earlier? Continue reading I failed in my previous McKinsey PEI – when can I re-apply? Can my McKinsey PEI examples come from experiences some years ago, related to work? Many candidates wonder how recent their McKinsey PEI stories should be, and if they need to be related to their work experience (in case of young professionals). So let’s look at those 2 topics one after the other. Continue reading Can my McKinsey PEI examples come from experiences some years ago, related to work? Ideally you can use the typical McKinsey hierarchy for laying out your motivation in 3 different layers (and only in this sequence with client-focus first, and your personal benefits last – since you are in the service business, with the goal of serving your clients best, and for this reason the primary motivation should stem from this area): Continue reading What should I say about my motivation in the Entrepreneurial Drive McKinsey PEI dimension?